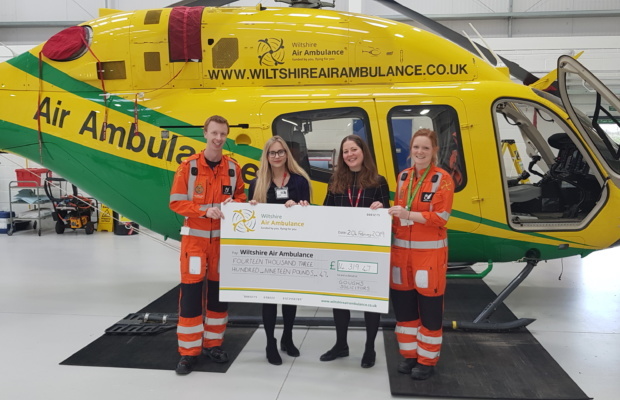 Over the past two years, employees at Wiltshire based law firm Goughs Solicitors have been fundraising and hosting staff events and are proud to have raised over £14,000 for Wiltshire Air Ambulance. Since the beginning of Gough’s partnership with the charity, they have managed to raise in excess of £30,000 for Wiltshire Air Ambulance. A significant proportion of the money raised by Goughs has gone towards the creation of the charities new air base in Semington, allowing their helicopter, aircrew and charity team all to be on the same site at the same time. Wiltshire Air Ambulance provides a vital helicopter emergency medical service throughout the county, saving the lives of people living, working and travelling in Wiltshire. It currently costs £3.75 million per year to keep the air ambulance operational and the charity relies on donations. Over the course of the last two years, Goughs held and participated in a number of events in support of Wiltshire Air Ambulance, including hosting the “Goughs Golf Day”, participation in the Corsham 10k, running charity curry events, office tuck shops, dress down days and donating fees for document signing. Kevin Basnett, managing partner at Goughs Solicitors commented, “We are very pleased to have raised this money for such a worthwhile cause. Wiltshire Air Ambulance undertakes essential lifesaving work, day and night, for the benefit of everyone in Wiltshire – we are extremely lucky to have such a valuable service in our county”. Valerie Whistler, partnerships coordinator for Wiltshire Air Ambulance, said, “We are very grateful to Goughs Solicitors, who are long-standing and very dedicated supporters of our charity. “Goughs were one of the original members of our 100 Club for local businesses, they helped us significantly during the Airbase Appeal and, to date, have raised in excess of £30,000 to support their local air ambulance. Pictured above: Emma Taylor (right) and Daisy Froggatt​ (left) from Goughs with paramedics from Wiltshire Air Ambulance.